I was looking forward to writing this one! This is one of the most fun parts about Holland Lops, getting to learn about how they are judged! The awesome thing about Hollands is that the best show quality animals (the ones that match the breed description in the Standard of Perfection the best) are usually the cutest. So our breed is literally designed to be cute! That's pretty cool, if you ask me. The Hollands in the pictures below are owned by me or were owned by me. 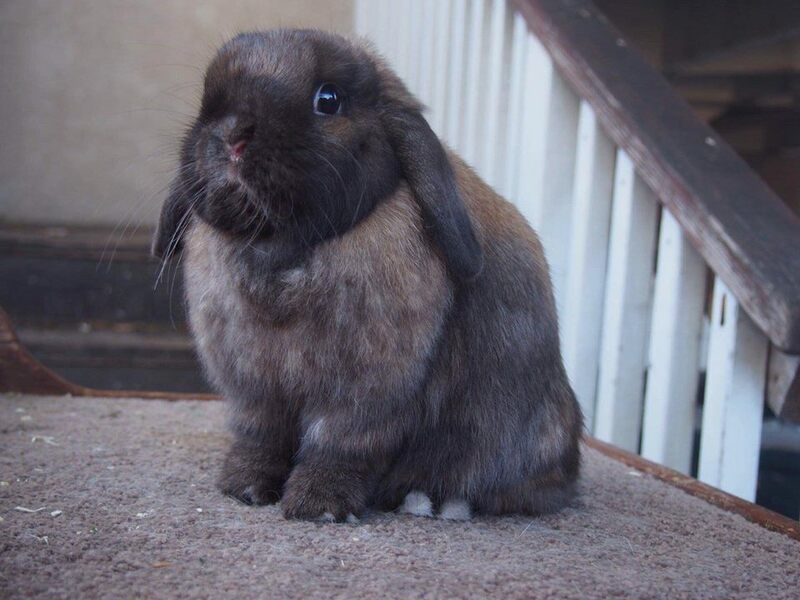 I show several pictures of rabbits I have sold as pets, as well as examples of my past and present brood and show stock to give you a comparison. This article is based on the most recent edition of ARBA's Standard of Perfection for Rabbits and Cavies, which is the property of ARBA, not me. I am sharing it for educational purposes only, I do not claim any credit. 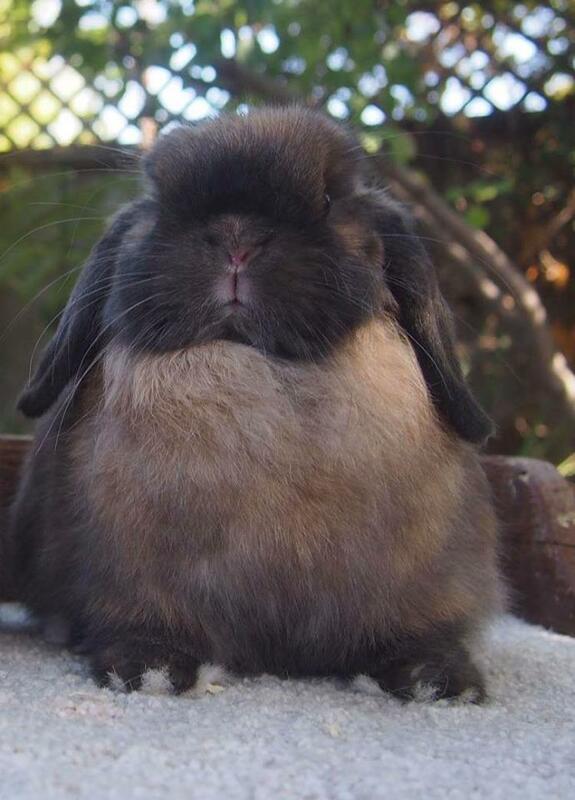 Holland Lops are judged on eight parts of their body. Each gets a certain number of points scheduled to it. The head of the Holland Lop is one of the first things you'll notice when evaluating an animal, and can make or break a show Holland. The head is to be large, bold, and broad in appearance, with a round face, extremely short and well-filled muzzle, and plenty of width between the eyes. You should not be able to see the eyes when viewing the animal from the front. Bucks tend to have larger heads than does, and seniors tend to have larger heads than juniors. Some common head faults are a 'snipey' head, a head lacking boldness, a small head, a flat face lacking curvature, a muzzle or cheek lacking fullness, and a head lacking side-to-side width as viewed from the front. 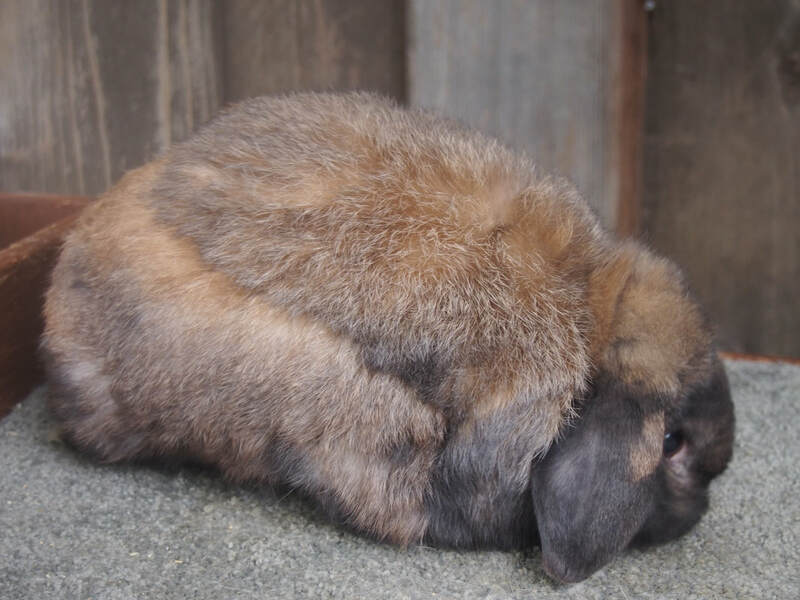 Holland Lops go through lots of head changes as they mature, and at different ages the head may or may not be proportionate to their body size. 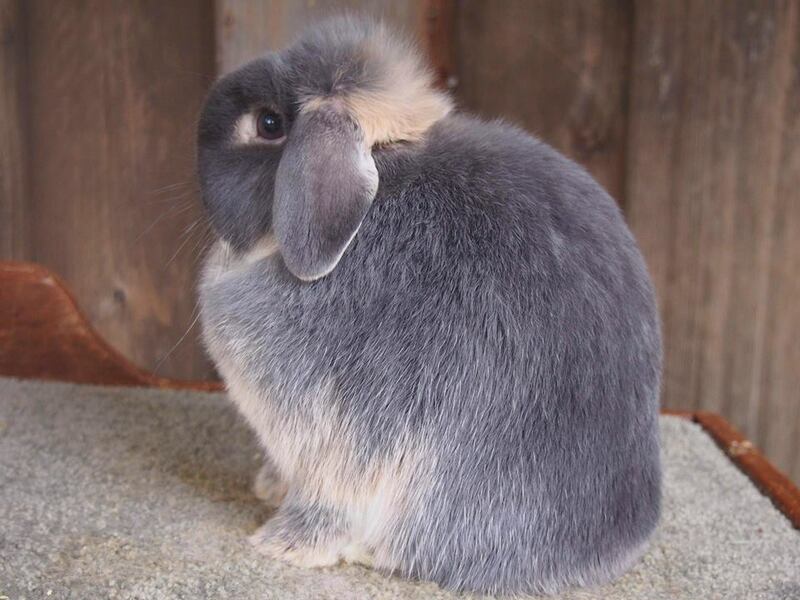 Holland Lops are very slow to mature, and for some rabbits it may take them two years for their head to fully mature. The heads of many does worsen once they've had a few litters. You can give some allowance to juniors for having slightly immature heads compared to the seniors, but you still want to look for the skull shape, a cute muzzle and cheek, and width between the eyes. This senior buck has an extremely good head. Notice how he has a beautifully short muzzle, tons of width between the eyes, and a short, wide skull. His head is also very large. 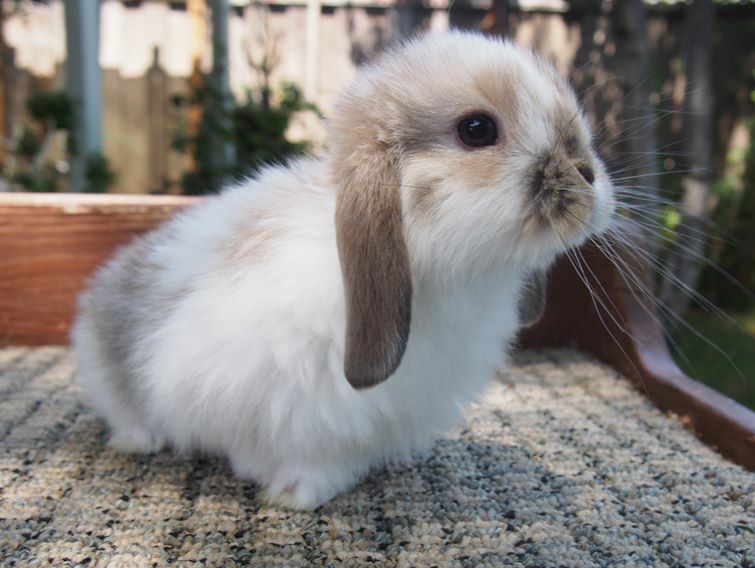 Oftentimes, a young Holland Lop with potential is sold as a pet, or, 'petted out' if they have a small head. This is often a mistake as many Hollands have immature, babyish heads until they are around 4 months old, when their head 'pops'. 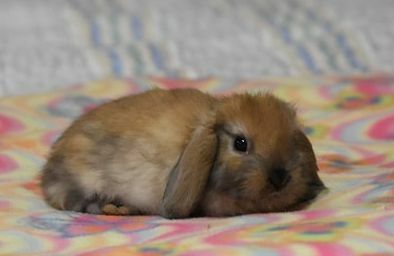 Heads that lack maturity will often go through a sudden 'pop' where they grow very quickly and get the characteristic 'bulldog' look desired in the Holland Lop breed. This 13 week old Jr doe displays an immature (but extremely promising) head. Like with the head, there's lots of stuff to look for with the ears. The first and most obvious aspect is ear control. Most rabbits have ears that prick up, but Hollands are required to have ears that lop. Therefore, any rabbit exhibiting ear control will be faulted, and any rabbit that carries the ears above horizontal will be disqualified. Sometimes, a rabbit will have one ear up and one ear down, which is called helicopter ears and is a fault. All rabbits exhibit some level of ear control, but we want as little as possible. We want the ears to hang vertically. Some Hollands when excited will clench their ears back or exhibit ear control, so oftentimes at shows, judges will assess the rabbit's true ear carriage from watching the animal in its cage when it is relaxed. With Hollands, we want a very short, thick, well-furred ear with rounded tips and a wide ear base. The thickness of the ear, also known as 'substance', contributes greatly to the look of a quality Holland. The wide ear base stops the ears from folding down the center, which is a fault. The ears should hang at or slightly below the jawline. In other words, the ears should be very short. This junior doe has a nice ear. She has no ear control, and her ears hang vertically. They have lots of substance and a wide base. She could use more furring, but her ears have a good shape to them and are rounded at the tips. The crown is SUPER important in Hollands. The crown is where the ears attach, and the look of the crown contributes greatly to the look of a quality rabbit. We are looking for lots of things with the crown. The easiest is substance. We want a big, bold, fluffy crown with plenty of depth. That is called crown definition. A skimpy crown lacking definition is much less impressive than a full, defined one. Another thing we look for is a crown with lots of side-to-side width, which causes the ears to hang vertically in a horseshoe shape when viewed from the front. Rabbits with ear control often lack side-to-side width. This is referred to as a 'tight crown'. Extremely tight crowns cause the ears to be carried above horizontal, which is a disqualification. Judges generally assess the ear and crown when the rabbit is in the judging cage prior to being handled. This is because rabbits that have already been poked and prodded by a judge are less likely to show their true ear carriage, and the crown may appear worse than it actually is. The crown should also have front-to-back width. This causes the ears to have a wide, open base. Crowns that lack front-to-back width generally cause folded ears. The last thing we are looking for is crown placement. The crown should sit on top of the head. The way we evaluate crown placement is by looking at where the ears are. 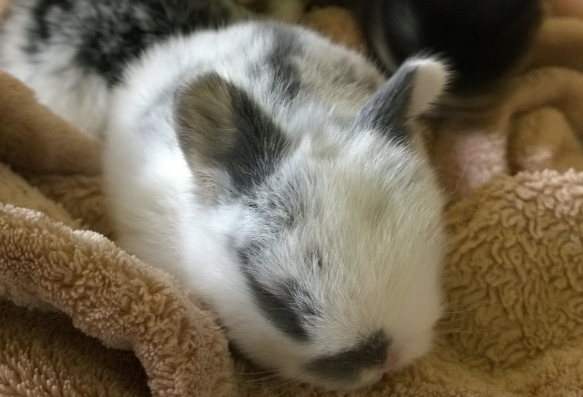 When the rabbit is at rest, the ears should hang directly behind the eyes with no space in between them. If there is ANY space between the ears and the eyes, this is called a slipped crown. Slipped crowns can often be seen from a young age, and rarely correct themselves. They are arguably the most common fault in the breed, but a rabbit with a well-placed crown is truly a beautiful sight to behold! This is an example of a pre-junior doe with a slipped crown. See how it causes her ears to be set too far back from her eyes? She does have good front-to-back and side-to-side width. This causes her to have no ear control and fairly open ears. This doe was sold as a pet. This is an example of a junior doe with a good crown. She has a nice, wide ear base, which is caused by front to back width of the crown. She has good crown definition, and decent side-to-side width, causing her ears to hang close to vertically. See how it creates that horseshoe shape with no ear control? It could still use more extreme width to cause the ears to hang completely vertically without pointing outward at all. She is slightly slipped in her crown, though not terribly so. Crowns are tricky to get right! The body carries the most points out of any part of the Holland Lop. The ideal Holland is extremely short, wide, and thick, and carries extreme mass while still being under 4 lbs. You want lots of width between the front legs, which means a wide chest plate. You want a cobby animal, not a long and narrow one. A Holland Lop should have zero daylight showing underneath its belly. We want a broad and well-filled hindquarter that is full to the table, a short, rounded midsection, a short and tall shoulder that results in a high head mount, and an almost nonexistent neck. The topline is very hard to describe, so check out the pictures below for more on that. The hindquarter should not be pinched, that is a major structural fault as it can cause kindling problems in does. Pinched hindquarters cause the hocks on the rear feet to turn inward and the rear toes to stick out to the side rather than being carried parallel. You also don't want an undercut hindquarter, meaning a hindquarter that tucks inward. A low shoulder is undesirable as it causes a low head mount. 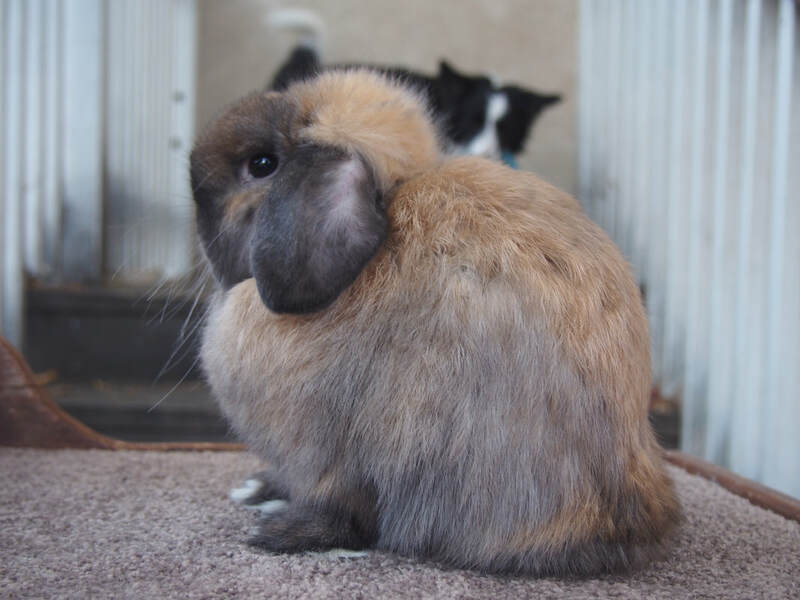 A long midsection (the middle of the spine) causes the rabbit's pose to be lurched forward, again not exhibiting proper Holland Lop type. Many people hold the head of their Holland (thus forcing them into a pose) to evaluate the body. This is NOT correct!! 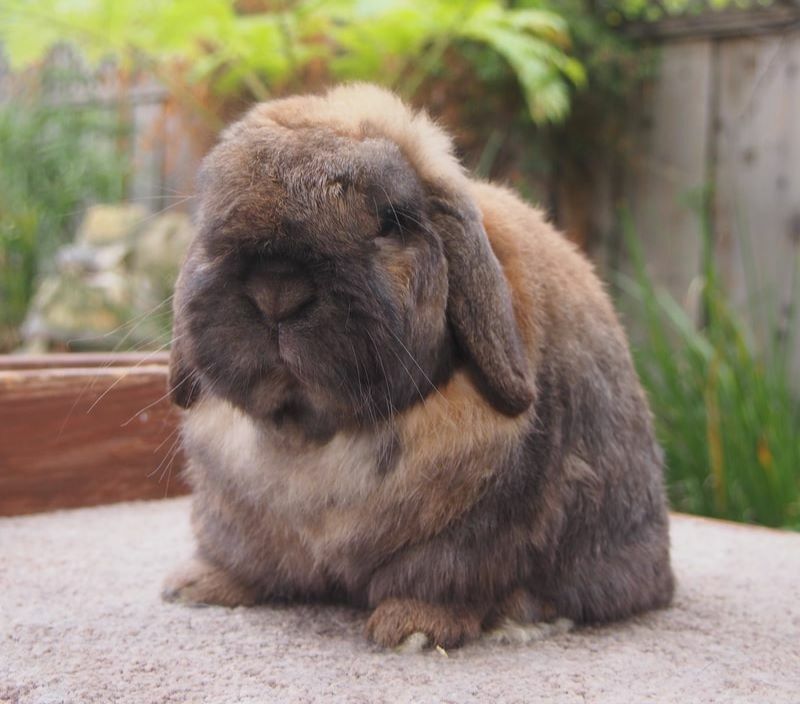 We want the Holland Lop to sit in its natural pose with only light guidance. By holding the head up, you are sculpting the rabbit into the mold of how you want it to look, rather than posing it in a way that exhibits both its strengths and weaknesses. Learn more on posing Hollands in this article. This junior buck has one of the best bodies in my herd. He has a gorgeous topline, due to his short shoulder, short, well-rounded midsection, and a smooth transition to his hindquarter. His chest is broad and well-filled, and exhibits width between the front legs. He has depth at the shoulder, and depth at the hindquarter, and has a very good head mount. He is short enough in body to balance with her depth and width. He could use even more fullness to his lower hindquarter, and a touch less length in his midsection. The prejunior buck below has several body faults. He slopes off in his hindquarter, and lacks the smooth topline I look for in my herd, and is low in his shoulder, but his main fault is overall length. When compared to the black otter pictured above, this buck has far too much length of body - especially in the midsection, but also in the shoulder. A long, low rabbit is extremely undesirable in this breed. This buck was sold as a pet. 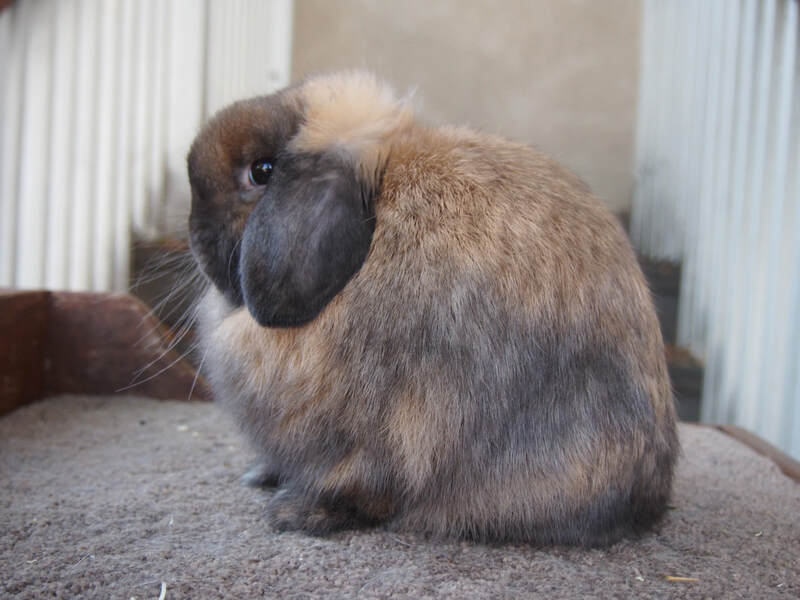 Bone is an often ignored element of the Holland Lop. Bone refers to the front and back legs. The Holland Lop is supposed to have very short, thick, dense bone, and well-developed ankles. The front limb should be straight, with the feet directly underneath. A weak ankle causes a rather unattractive fault called 'flipper feet', which is when the feet are carried at an angle with the leg rather than pointing directly down. The rear feet should be parallel, and should be very short and wide. A good ratio to shoot for is a rear foot no less than half as wide as it is long. If the points of the hock turn inward, this is a fault and is usually connected with pinched hindquarters. Bone can be evaluated even in young kits, as bone doesn't tend to improve with age. 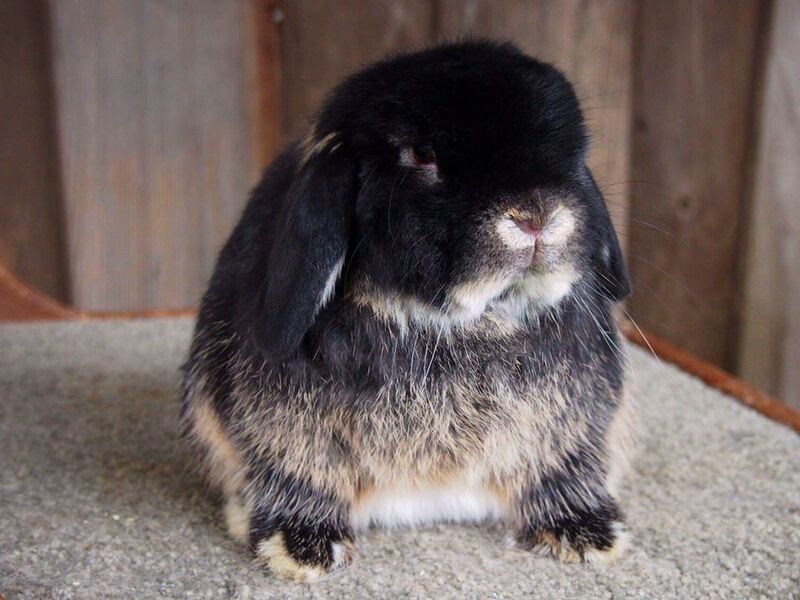 A Holland Lop's high head carriage should NEVER be the result of the rabbit sitting up high on long front legs. It should be the result of a deep shoulder. The legs should be very short, and look like tree stumps. This junior doe has excellent bone. Her legs are short and straight, with extreme bone density as called for in the standard. She also has straight, well-developed ankles with no flipper feet. The fur of a Holland should be very glossy, thick, and dense. It should be fine in texture and approximately 1 inch in length. The fur should exhibit rollback type, meaning it gradually rolls back to its normal position when it is stroked the wrong way. You don't want an extremely short coat, an extremely soft coat, a dull or lifeless coat, or a long or woolly coat. A coat with a very soft or woolly texture could mean the rabbit is a 'fuzzy' carrier (more on fuzzies in this article). This junior doe has excellent fur. It is very dense and carries gloss throughout, as seen most easily on her forehead, and is an appropriate length. It has no woolly texture. This doe is also in excellent condition, so her fur shines in the light. 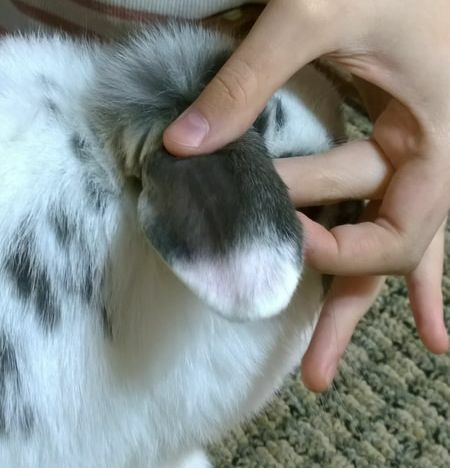 This is the least important aspect of the Holland Lop. Each color has its own specific variety description (look at your Standard of Perfection for more info on each specific color), so it would be impossible to cover all of them in the scope of this article. In any color, scattered white hairs along the back are a fault, unless they group together into what is called a 'foreign spot of color', in which case it would be a DQ. In Broken Pattern animals, the 4 points allotted for color are divided in half - with 2 points being for color, and 2 points being for pattern. Some faults for Brokens are uneven markings, especially on the nose, scattered white hairs in the colored patches, and white-dipped ears. You want an evenly balanced nose marking, either nose spots or a 'butterfly' marking. As long as there is color on at least part of the whisker bed, the rabbit won't be DQed. There are several general color disqualifications you should know about. Incorrectly colored toenails or eyes, as well as unrecognized colors (such as silver marten, Vienna, or torted otter aka fox), and lack of color on the nose in a Broken. Foreign spots on any variety are a DQ. Also, any Broken rabbit with under 10% marking color (in the judge's opinion) will be disqualified. These are often called Charlies. Since color is only worth 4 points in Hollands, color FAULTS are very minor and usually aren't a big deal in the show ring unless maybe the two top rabbits are identical except for markings. But I wouldn't stress about color too much, as long as it's there and there are no DQs. This Broken senior doe has white-dipped ears, which are a mild color fault. This Broken doe kit has a half-butterfly. It's technically a mild fault but I think it's super cute anyway, lol. Luckily it isn't a big deal at all. She also has white-dipped ears, like her dam, the senior doe pictured above. 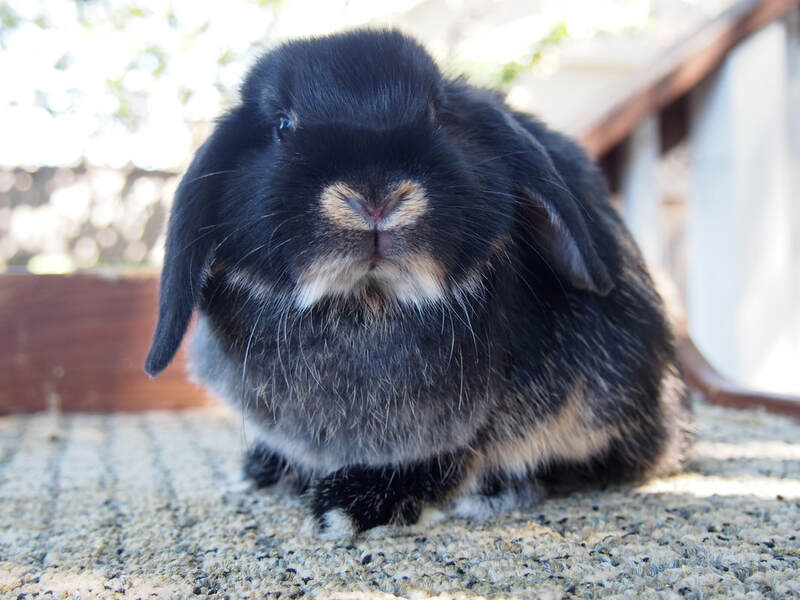 A Holland Lop in good condition should have a good weight for its size, be neither fat or thin, have a glossy, dense coat, be alert and curious about its surroundings, and have no diseases, infections, parasites, or injuries. The rabbit should not be in a molt (although Hollands seem to plan their molts to fall on show days). This senior doe is in excellent condition, and carries a good weight on her. Her coat is lush and beautiful, and she is free of disease, injury, etc.. This senior buck is in good body condition, is free of disease, injury, etc., but is in a horrible molt! This happens several times per year with Hollands, and is normal. It is a fault. 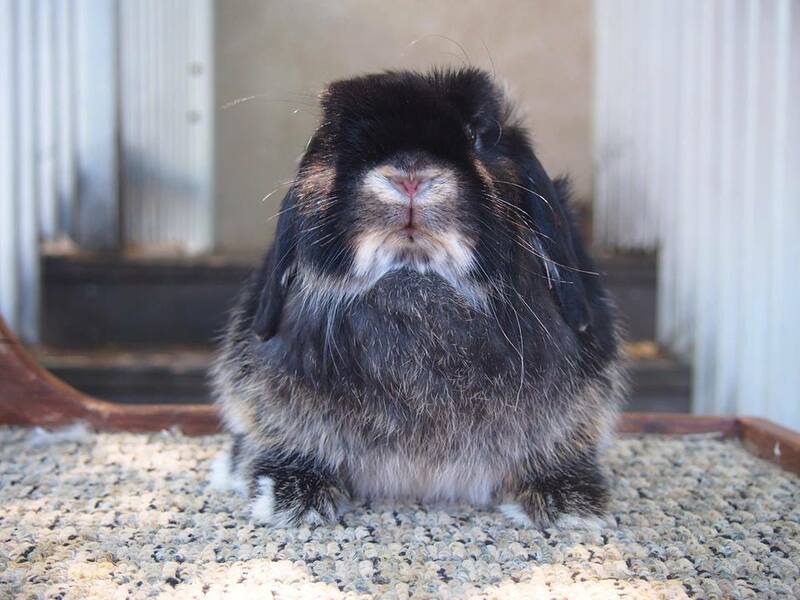 What is your pet-peeve when it comes to Holland Lop structure? In other words, what fault bugs you the most? For me, it's slipped crowns, bad toplines, and narrowness of body. Tell us below in the comments section!